Peace: Is It Yours If Not, Why Not? THE PEACE OF GOD-FORGETTING INDIFFERENCE. Absence of alarm is, in itself, no real guarantee of safety. Every fisherman's baited hook, every hunters baited trap supposes this. "When a strong man armed keepeth his palace, his goods are in peace," said the blessed Lord (Luke 11:21). Nor does He leave us in doubt as to who the "strong man" is. It is the devil•the master "hunter," with all his well-hidden, unsuspected schemes, who cries, "Peace, peace, when there is no peace," Jer. 6:14. But when the Spirit of God begins to work in the soul of one of Satan's prisoners, and conscience is thoroughly awakened, it is soon discovered that the "prince" is more than entertainer in his palace - he is an "armed" keeper at its gates; and it is then that the heart needs comfort, and help, and warning, too. Fear not the warning, reader, and the discomfort of it, in the end it leads to peace. Fear instead him who teaches you to avoid negativity, for that could be the "strong man's" soldiers trying to keep you from true peace by holding you in a false peace. SEEKING TRUE PEACE IN A FALSE WAY. You might as well spend your time in wandering through the mountains in search of water of its own natural force running uphill, as to try to find peace by methods which only turn God's order of blessing upside down. For the result in both cases would be exactly the same •CERTAIN DISAPPOINTMENT. To explain. We will turn to four short sentences in the closing chapters of the Gospel of John, and first look at them in the order in which they are divinely recorded for us, and then at the way in which they are distorted in the minds of thousands of honest seekers after peace. "IT IS FINISHED," John 19:30. The promise of God fulfilled. The cup of judgment drained. The heart of God toward man expressed. "PEACE BE UNTO YOU," John 20:19. The result of "It is finished" made known in resurrection by Him who finished it. "FOLLOW THOU ME."' 21:19 An easy task when the heart's affections are engaged. And this is God's order. The false notion that exists in the mind of fallen man as to God's real attitude toward him is an effective weapon in the hand of the devil. The sinner imagines that something is necessary on his part to draw the heart of God toward him; and on this string the enemy harps many a doleful song. Whereas the real truth is the very reverse of this, namely, that something on God's part was necessary in order to draw the sinner's heart to Him. Therefore we read, "The Son of man must be lifted up," and "God so loved the world, that he gave his only begotten Son," John 3:14, 16. Of His own gracious sovereign will He has approached man for his blessing. The very presence of His Son in this world was God's great "FEAR NOT" for sinful men; while His presence in glory, now that the work of the cross has been accomplished, is God's proclamation that there is NOTHING LEFT TO FEAR for hearts that believe on Him. The cross of Christ is the great declaration of what God's feelings are toward us. But even the cross did not originate the love of God. It would be an insult to the heart of God to say so. The cross was the means, but not the source of our blessing. "By the grace of God" He tasted "death for every man," Heb. 2:9. "The Father sent the Son," 1 John 4:14. "It is the blood that maketh an atonement for the soul," and "I have given it to you upon the altar," Lev. 17:11. So that instead of God's love being drawn out by man's goodness, it was really expressed in meeting man's badness, and this when, in reality, man had not the least power for goodness. "For when we were yet without strength, in due time Christ died for the ungodly," Rom. 5:6. If, therefore, the sufferings and death of Jesus were not needed to draw the grace of God toward us, let us not imagine that any work of ours is necessary to do it. But suppose, for a moment, that we could do it, that, by a well-kept resolution to lead a better life, we could dispose God's heart toward us for the future, there would still remain God's righteous reckoning for the past. For thus it is written, "God requireth that which is past," Eccl. 3:15. And with such a requirement hanging over our heads how could we possibly have peace? God's righteousness must be respected. SATISFACTION FOR GOD MUST PRECEDE OUR PEACE WITH GOD. How was this? He had, poor fellow, like many others, begun at the wrong end for solid satisfaction. In the matter of an ordinary debt, who is it that claims the right to subscribe `settled' on the account? The creditor, of course. Exactly. It would be of no value whatever for the debtor to do it. It would give neither satisfaction to his creditor nor peace to himself. The debtor's peace is only the natural consequence of knowing that the Creditor is satisfied. In like manner the only true way of getting 'peace at the bottom' is to see that the whole sin question has been settled from the top. After several unaccepted answers were given, a bright-faced little girl said, `It is enough for you, because it is enough for God.' That is it, my dear! If God is satisfied with the settlement of His own claims, so am I.' The very secret of peace lies in that dear child's answer. It is of the greatest importance to see that satisfaction for a forgiving God in the presence of an accusing enemy must precede peace with God for a forgiven sinner in the light of an upbraiding conscience. It is of infinitely greater importance that God should be righteously able to silence the accuser than that you should. Take an illustration. A man once stood charged with the violation of a newly made law. The statute had only just obtained government approval when the said offender was discovered acting in direct opposition to its known behest, regardless of the heavy penalty he was incurring. It is true that the culprit thought he had a very good reason for his course of conduct, but that is not the point before us now. As to the weight of the condemning evidence there was no manner of doubt. Even the offender himself gave the charge no denial. Only one person in the whole realm seemed to be disturbed about the matter, and this not the culprit but the king. But he felt it, felt it deeply, and, setting his heart to deliver the offender, he labored at his task till the going down of the sun. Now consider the king's position for a moment. His longing heart struggles in one direction, his written law compels him in another direction. He has a high personal regard for the offender, but what is he going to do with the offense? King Darius found himself in a painful position. Peace he had none. Great conqueror he might be, but when the sun went down that night all his hope of conquering this difficulty went down with it. He must do violence either to his heart's best wishes, or to the honor of his own written law. Satisfy both he cannot. The eyes of the nation are upon him. The accusers are doggedly determined. What can he do? Each side is weighed with due deliberation, till unbending justice carries the day. Daniel must go to the den! Now we read that the accusers brought their charge twice before the king (see Dan. 6). By way of illustration let us suppose that, between their first appearing and their second, and all unknown to the accusers themselves, Daniel had actually been cast into the den, that the lions' mouths had been stopped, and that he had been taken out again by the very king who put him in. Next morning the accusers appear for the second time to press for the execution of the penalty. Let us, for a moment, pretend this is conversation. `You are well aware that Daniel the Hebrew has broken it, and thereby incurred the penalty plainly set forth in the same.' The king further agrees. `Just the opposite. Instead of there being any miscarriage of justice, it is my very righteousness that now forbids his going to the den. My law has been honored, my throne left stainless, and my heart's desire gratified into the bargain. Daniel has already been cast into the den of lions, and after satisfying the utmost claims of a broken law has been taken out again. PEACE THAT DEFIES THE ACCUSER. It is of the utmost importance to be clear on this point-that is, to see distinctly how the truth of the resurrection of Him "who was delivered for our offenses" (Rom. 4:25) stands in relation to our peace. God's seal of satisfaction is our challenge to the enemy. • A man is condemned for some violation of the law, and the penalty seven full weeks in jail. • When will he be free? • When his full term of seven weeks has expired, and the government authorities have taken him out of jail. • But wait. The Sovereign has allowed a friend to go to prison in his place. • When will the culprit now be free? • When his friend has been taken out. The moment the substitute is out the offender is free! Now, though it is certain that the Lord Jesus had no sins or offenses of His own to answer for, the believer can say, He made Himself responsible for the penalty due to me. To use our figure, He went down into the "den," down to the place of executed judgment, yea, down to the very bottom •Praise His name•down to death itself. The "Good Shepherd," by dying for His sheep, has effectually stopped the "lion's" mouth forever. Oh, the wonders of redeeming love! But He is risen. "The God of peace... brought again from the dead our Lord Jesus, that great shepherd of the sheep, through the blood of the everlasting covenant," Heb. 13:20. He "was delivered for our offenses, and was raised again for our justification," Rom. 4:25.
Who can say that the culprit is free so long as his substitute still remains in prison? Who can claim that his debt is canceled till a full payment has been accepted by the Creditor? Therefore the apostle says, "If Christ be not raised, your faith is vain; ye are yet in your sins," 1 Cor. 15:17. But if God has raised out of death the One who went there for our offenses, we are certainly delivered from our offenses. "Therefore," says the apostle, "being justified by faith, we have peace with God through our Lord Jesus Christ," Rom. 5:1. • `I can,' says Satan. • "It is Christ that died," answers the believer. • `True; but I have not sinned more than God knew when He gave His only begotten Son to die for me, and He it is that tells me that I am justified by the blood, "justified from all things,' Acts 13:39. But what if the believer should fall into sin? What then? "If any man sin we have an advocate with the Father, Jesus Christ the righteous," 1 John 2:1. Indeed, He has engaged to conduct safely to glory all that the Father has given Him (John 6:37-39; Heb. 2:13). He who once righteously answered for our sins before God still lives engaged to maintain our communion with the Father •"Jesus Christ the righteous." WE HAVE PEACE WITH HIM WHO KNOWS THE WORST. Nothing, perhaps, is more important to see than what has just been stated, namely, that it was in the fullest knowledge of the whole of our guilty history that God's kindness and love appeared (Titus 3:4). But will not this lead to carelessness of walk? The very opposite. It is this which begets real confidence in the heart, and produces true holiness in the life of a believer. To emphasize this we will suppose another case. A housemaid is busy with her daily work in her employer's dining-room. While dusting the mantelpiece she is not aware that her duster has caught upon a costly vase, and in drawing it sharply away she drags the vase down to the hearthstone, shattered to atoms! She knows well enough what her master will feel about this, for, besides being a choice work of art, it has been handed down as an heirloom in the family for generations past. How bitterly she condemns herself for her carelessness, and is just saying to herself, How can I possibly face my employer about it, when the drawing-room bell summons her into his presence. With a heavy heart and great trembling she answers the call. Does the reader think that this new and unexpected experience of her employer's kindness would make her more careless about her work for the future? No, no; the very opposite. And so with those who know the grace of God in Christ. Not only has He forgiven all they have done, but in doing this He knows all they will yet do, and moreover has bestowed the gift of the Holy Ghost for the present enjoyment of His love (Luke 24:49; Rom. 5:5). With such a God acquaint thyself, my reader, and be at peace (Job 22:21). "Preaching peace by Jesus Christ," Acts 10:36. We have sought to expose the enemy's device of setting honest souls to seek for true peace in a false way, to 'make their peace with God,' as it is called. Now we have to notice one artifice more. Multitudes, no doubt, have been, and are still, kept in sorrowful uncertainty through taking up a wrong attitude in connection with the sacrifice and death of Christ. They confound between that which was offered to God for His acceptance, and that which is brought to them for theirs. If you were to try and unlock the front door of your house by the key that only fitted the back door lock, you might lose much valuable time in the attempt. The key itself might be all that could be desired, but that fact would not enable you to open the wrong door with it. The fault would be in yourself, not in the key. Perhaps a couple of examples of a wrongly applied 'key' might be a help to some perplexed reader. 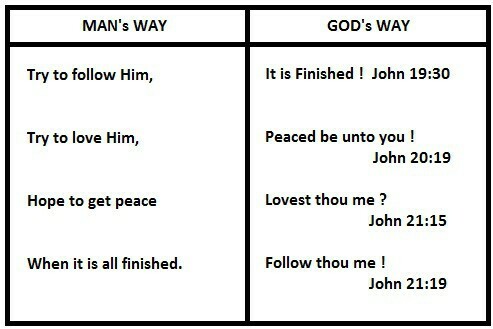 Now, the way Scripture uses the first of these is very distinct from the way it uses the second. What is offered "to God" is very clearly distinguished from what is offered "to you," and you can no more use them interchangeably than the manager of the Bank of England could use the key of your kitchen door to open one of his thief-proof safes. Put the right key into the right door, and in less time than it takes to write the sentence the thing is done. Now first note this. When Christ offered Himself as a Sacrifice for sin, it was not to you that the offering was made, no more than, in the type, the offering was made to the man who had sinned. Heb. 9:14 says distinctly that He "through the eternal Spirit offered himself without spot to God." None of you "can by any means redeem his brother, nor give to God a ransom for him," Psalm 49:7. Now, the offering not being made to you, the acceptance of it does not devolve upon you either. Wherefore, then, all the trouble you have given yourself as to whether or not you have rightly accepted His work? If the offering is made to God the acceptance or rejection of it rests with God also. Your acceptance of it would avail you nothing if God had not done so. It would be no more, as we have seen, than the debtor writing 'settled' on his creditor's account. But if He has accepted it (and blessed be God He has: the Sacrifice was of His own providing) you may be sure it is because He has found infinite satisfaction in it. But now come to your side, for something is presented to you also. As surely as there was something worthy of God's acceptance, there is something worthy of yours. "To you is the word of this salvation sent," Acts 13:26. It "is a faithful saying, and worthy of all acceptation" (1 Tim. 1:15), and it is your wisdom to accept it. No worthiness on your side is expected. You have simply to condemn yourself for what you have done, and thankfully receive the news of what He has done; or, in other words, to "repent... and believe the gospel," Mark 1:15. But let us now turn to another example of what we have called a wrongly applied 'key.' We refer to two sets of four words. With a sense of their need two blind men came to Jesus and sought His mercy. The Lord inquires, "Believe ye that I am able to do this? They say unto him, Yea, Lord." Then He touched their eyes, saying, "According to your faith be it unto you," Matt. 9:27-30. Just turn, then, to the verse quoted, and notice two things. First, who it is that says, "According to your faith," and then on what ground He says it. First, it was Jesus who said it to the blind men. Then as to the ground (or the basis). 1. They wished for the blessing. 2. They believed that He was able to give it to them (Matt. 9:28). And was this enough to secure the longed-for answer? Yes. In this ground it was that the Lord said, "According to your faith be it unto you." It springs from what He is, and hence the importance of seeing that there is another "according" to consider, one that looks in another direction, not at your faith, but His faithfulness. The response of the most blessed among women to the heavenly message delivered to her by Gabriel is really the language of all who are divinely assured: "Be it unto me according to thy word," Luke 1:38. How simple! how beautiful! Faith never makes itself an object. It looks up to the Lord and says, 'I want no better guarantee of certain blessing than that which "Thy Word" gives me.' And looking into the face of every gainsayer it can boldly say, "Hath he said, and shall he not do it? Or hath he spoken, and shall he not make it good?" Num. 23:19. Now, reader, for a plain question: Have you "peace with God"? and if not, in view of what God is, what Christ has done, and what the Spirit has testified, we ask, WHY NOT? But there is yet another aspect of peace to consider. "Be anxious for nothing; but in everything by prayer and supplication with thanksgiving let your requests be made known unto God. And the peace of God, which passeth all understanding, shall keep your hearts and minds through Christ Jesus," Phil. 4:6,7. We must not confound the "peace" mentioned in this passage with the "peace" we have already been considering (Rom. 5:1). It is a great loss to do so, though often done. But perhaps the reader may say, Is this not a mere distinction without a difference? Surely "peace" is "peace," whichever way you look at it. You are mistaken there. That which disturbs the peace is not always the same, and therefore peace has not always the same character. When "peace with God" is spoken of, sin is the disturbing thing, and conscience the thing disturbed; but when the "peace of God" is spoken of, earthly care is the disturbing thing, and heart and mind the things disturbed. Again, "peace with God" is something we have •"we have peace with God;" while the "peace of God" is the peace He has, only, wonderful to say, He gives us to enter into it with Him. There is therefore a vast difference between the two. Peace with God is the result of a transaction that took place only once, which can never be repeated. The peace of God must be sought as often as I have a disturbing care. By way of illustration let us suppose a case. A certain medical man attends the prisoners in the county gaol. A man in whom he has a special interest is brought there for some offense. There was an alternative penalty of a fine, but the man was too poor to pay it. The doctor finds, moreover, that there is another matter that is troubling the prisoner. He is suffering from some internal growth. Now, this man's release from a deserved penalty and his relief from a bodily ailment are not more distinct in their character than is our getting "peace with God" distinct from our enjoying the "peace of God." Yet how many, to their own loss, confound between them! The blessed God is not unmindful of the fact that sin is not the only thing that disturbs His people. He knows that their path to glory leads through a world of care. In view of this, there are three things He can do for them. 1. He can remove them beyond the reach of trial; that is, He can take them home. 2. He can remove the trial from them, but still leave them here. 3. He can allow the trial to remain, but calm their hearts in the midst of it. Stephen experienced the third before he was taken into the first (Acts 7:59, 60). Peter experienced the third as he lay that night in prison chained between two soldiers (Acts 12). Humanly speaking, a violent death was before him. James had already suffered, and in Herod's mind Peter was to follow. Yet there he lay in calm repose. His circumstances as dark as they well could be, his heart and mind evidently at perfect rest. Then followed his experience of the second. Chains and keepers are permitted to hold him no longer. An angel sets him free. One example more. The blessed Lord Himself is storm-tossed on the lake (Mark 4:37-41). The cry of His terrified followers arouses Him from sleep, and He rises from the pillow to still the storm. Now, if the Lord is personally no longer with us here to calm our fears by stilling our storms, He sits above the storms to accomplish what is still more wonderful, to calm our disquieted hearts. So we read it is "through Christ Jesus" that the peace of God keeps our hearts and minds (Phil. 4:7). Peter's case is a lovely example of this. Once, with threatened death outside the boat and discomfort inside, the terrified servant, with the others, had called for help while his Master was in the posture of repose. But now, with threatened death outside and prison discomfort inside, he has found at last his Master's pillow, and there he soundly sleeps till the deliverer awakes him. What a moral triumph! In order to have "peace with God," as we have seen, I must believe the Gospel which tells me that a full settlement has been made in righteousness between God and His Son on my account on the cross, and that a declaration of satisfaction has been issued in the tidings of His resurrection. In this work I had no share whatever, neither in Calvary's settlement nor in God's seal of satisfaction in it. But when it is a question of the "peace of God" the matter is altogether on a different footing. I must now go to God on my own account, go to Him in prayer. I must, as it arises, consciously deposit my care in His hand, and confidingly leave it there. The only child of a godly couple, we will suppose, is seriously ill. The doctor is fetched, but he holds out only a very slender hope of the boy's recovery. The parents are in an agony of mind about it. While the father is away fetching the medicine the distressed mother steals quietly to her own room and kneels down. A desperate storm of trouble is raging within her bosom. As she draws near to God, many a past mercy, even in connection with this very child, comes into her mind, and she feels what poor mean thanks she has given Him for all His goodness in the past. But now in broken sentences she truly thanks Him. Then the big burden of her heart is laid before Him. She prays with earnest supplication for her boy. The blessed High Priest above is sympathizing with her and graciously supporting her, and at last she is able to surrender her will to God, and put her boy unreservedly in His hands. Then she hastens back to her boy. Any improvement? Not the slightest that she can discover. Now, it was not the burden of sin that weighed upon her conscience, but one big care that pressed upon her heart; and, taking it to God, He caused the peace in which He Himself dwells to fill her heart and mind. God's peace our stronghold. There is another word in the verse calling for special noticeâ€•it is the word "keep"â€•"the peace of God... shall keep your hearts and minds." Well may faith say of such, "Thou shalt hide them in the secret of thy presence from the pride of man: thou shalt keep them secretly in a pavilion from the strife of tongues," Psa. 31:20. If you would see an Old Testament illustration of a saint at peace in God's `keep' turn to Psalm. 3. Perhaps no trouble touches a man so deeply as family trouble, because it touches him in his tenderest affections. It was so with David in this psalm. His beloved son Absalom, with thousands of the king's own subjects, had taken sword against the royal parent, and had driven him out of his home in Jerusalem. If anything could make a loving father hang down his head, the conduct of a son like Absalom would do it. But if an ungrateful son made David's head hang down, a faithful God was able to lift it up. "Thou... art... the lifter up of mine head." In that hour of heart anguish God was his resource, and prayer the way to reach it. "I cried unto the Lord with my voice, and he heard me out of his holy hill." What was the effect? Peace, calm repose. "I laid me down and slept... for the Lord sustained me" (Ps. 3:5). Had the enemies, then, all been driven away? No; but his fears had. "I will not be afraid of ten thousands of people, that have set themselves against me round about" (Ps. 3:6). "Thou... art a shield for me" (Ps. 3:3). He was safely garrisoned inwardly, though apparently still exposed outwardly. There is only one other great disturber of the peace, and he too shall be silenced one day. "The God of peace shall bruise Satan under your feet shortly," Rom. 16:20. Well may our hearts rejoice in such a God. Well may we ask each other, Are you enjoying this peace of heart and mind? and if not, WHY NOT?